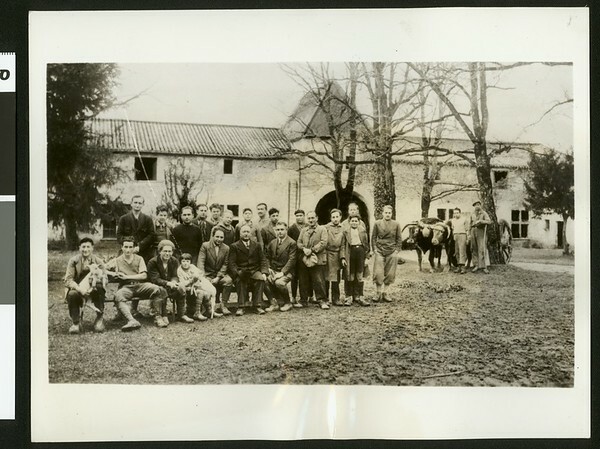 Photograph of a group of exiled German Jews in a farm school in Southern France. "2732682 | Watch your credit | International News Photo | Slug (exiled Jews) | Where exiled German Jews are repairing broken lives | Paris, France... A scene on the 150-acre farm school in the south of France where former German Jews, who were architects, doctors and lawyers, are now being "re-educated" for agricultural careers. The picture was brought back to the U.S. by Dr. Dmitri Marianoff, son-in-law of Prof. Albert Einstein. Dr. Marianoff founded the school to foster Jewish interest in agriculture and, more immediately, to train German Jewish exiles for such work. R-4-18-35-3/57" -- typed note attached to verso. "Received. Examiner reference library. Apr 23, 1935" -- stamped on verso.